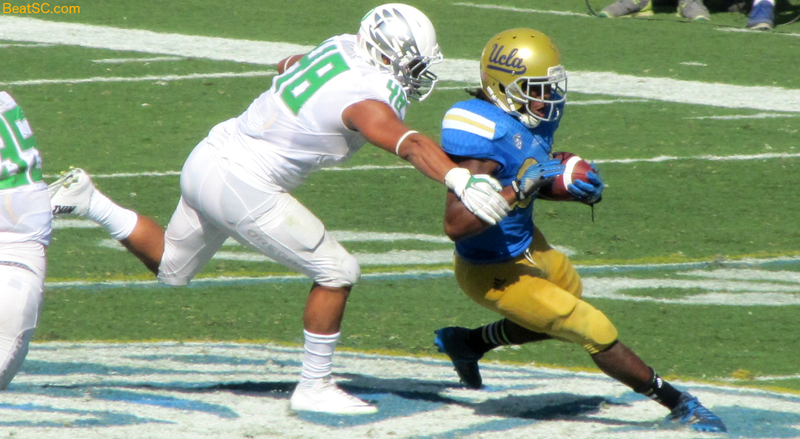 UCLA did not play their best game on Saturday against Oregon, but even if they did, they probably wouldn’t have had enough ability on both sides of the ball to challenge the Ducks. With Heisman hopeful Marcus Mariota running the Ducks’ high-octane Offense, UCLA just didn’t have the schemes or the talent to slow them down. 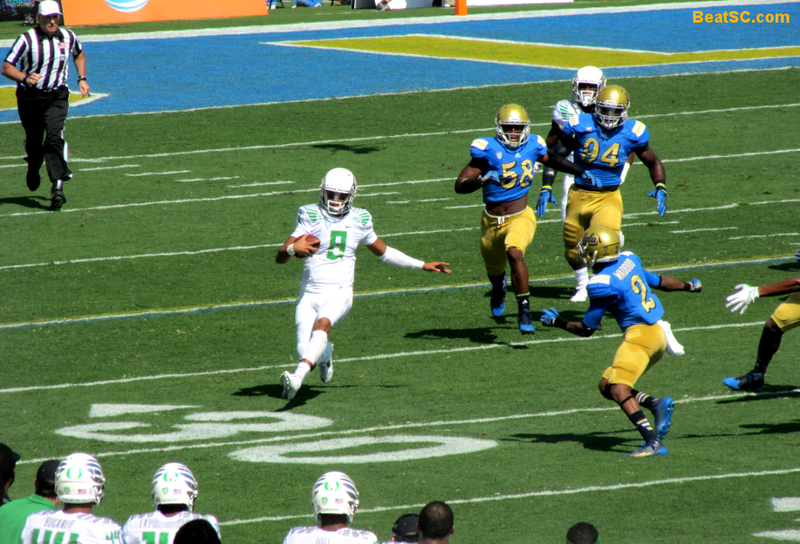 After a slow start, the Ducks settled down, and were able to run at will, and were also able to complete big passes when necessary. 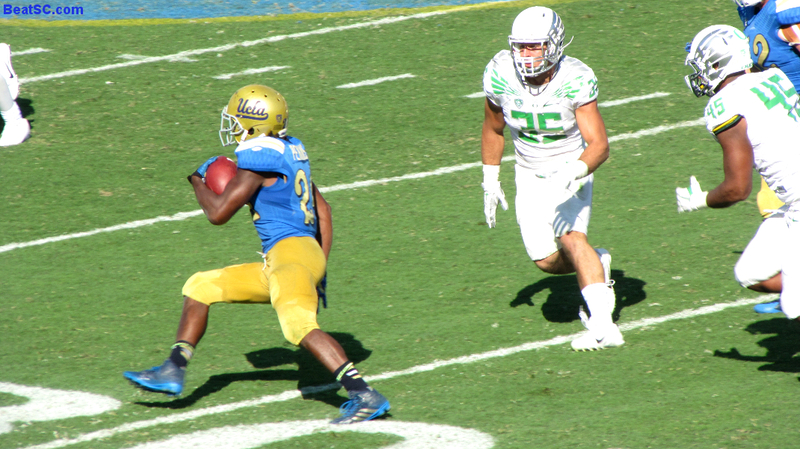 Myles Jack was all over the field for the Bruin D, but the Ducks eventually made him pay for his aggressiveness, as a Duck Receiver faked him out to get open behind him for a long TD reception. 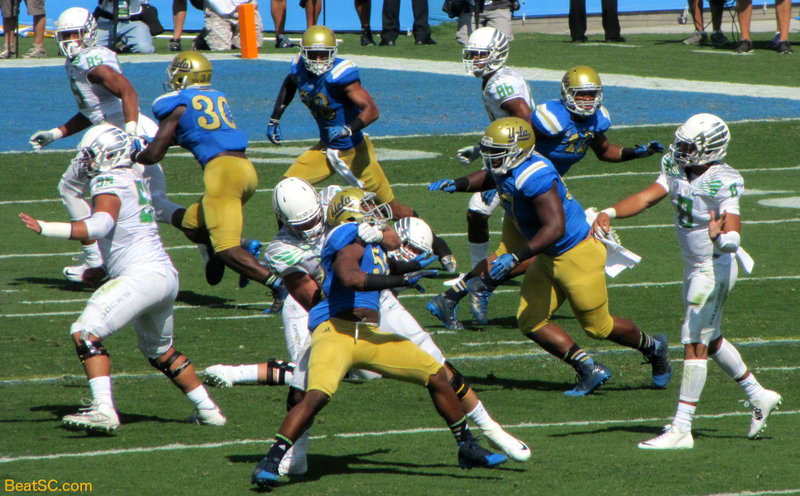 The Bruin Defense was struggling so badly, Defensive Coordinator Jeff Ulbrich got in a shouting match with head Coach Jim Mora. At one point, Ulbrich handed his play chart to Mora telling HIM to call the Defensive plays! It was 21-3 in the 2nd Quarter before Brett Hundley ran for a score to make it 21-10 at the Half. Then Oregon came out in the 3rd and scored 21 more without interruption, making it 42-10, basically putting the game on ice. 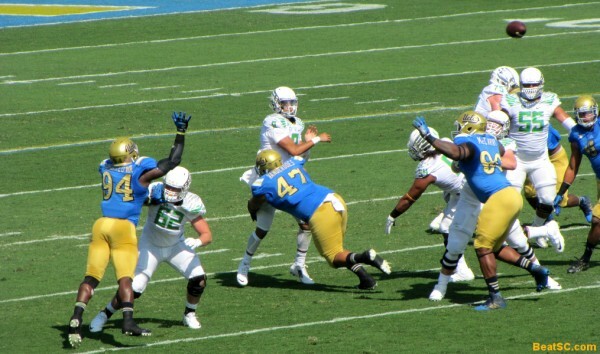 With the Ducks on Cruise Control on both sides of the ball, Hundley was able to direct the Bruins to 3 TD drives in a 2-miute span of the 4th Quarter, the drives culminated by a TD run by Nathan Starks and two TD passes to Jordan Payton, but the Ducks’ victory was never in serious jeopardy. 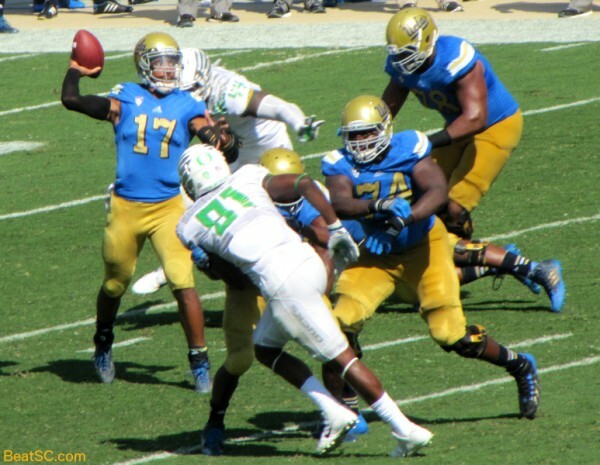 Hundley got sacked only twice, but on one of them, he was blindsided and fumbled. That led to a short field for the Ducks, and their first TD of the game. 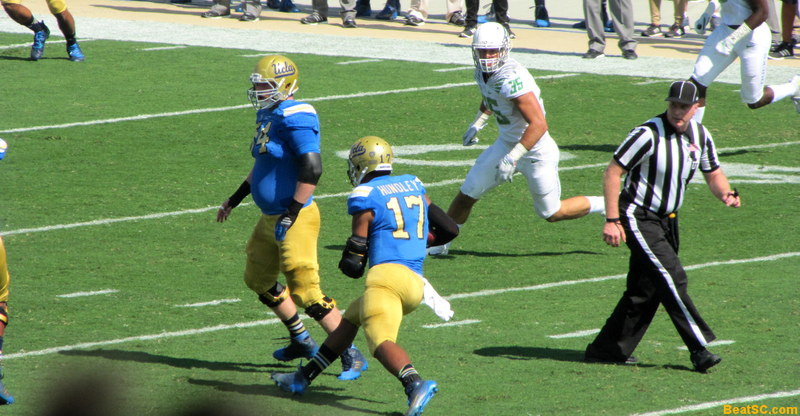 Later on, Hundley threw an Interception that gave the Ducks great field position again. 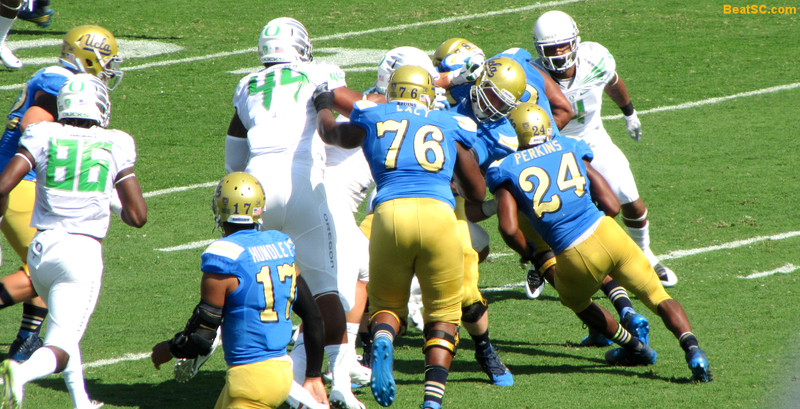 Even with Paul Perkins gaining a remarkable 190 yards on the ground and even with Hundley adding 119 rushing yards of his own (minus 30 in losses for a net of 89), it wasn’t enough to overcome 7 Penalties including 4 Personal Fouls and the 2 Turnovers. 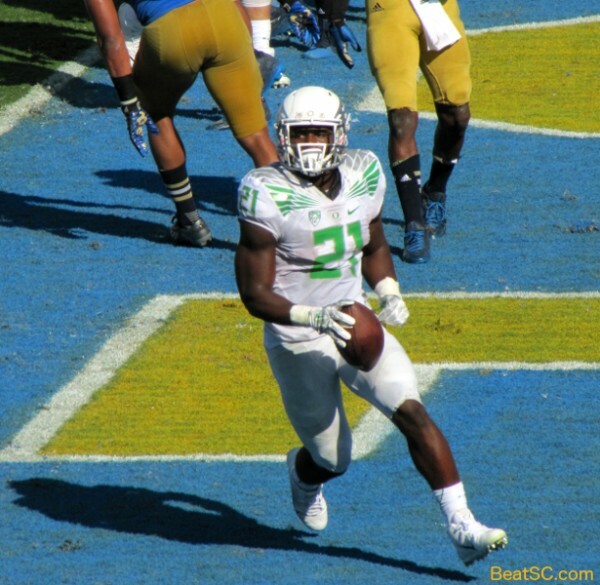 No shame in losing to the formerly #2 Ducks. 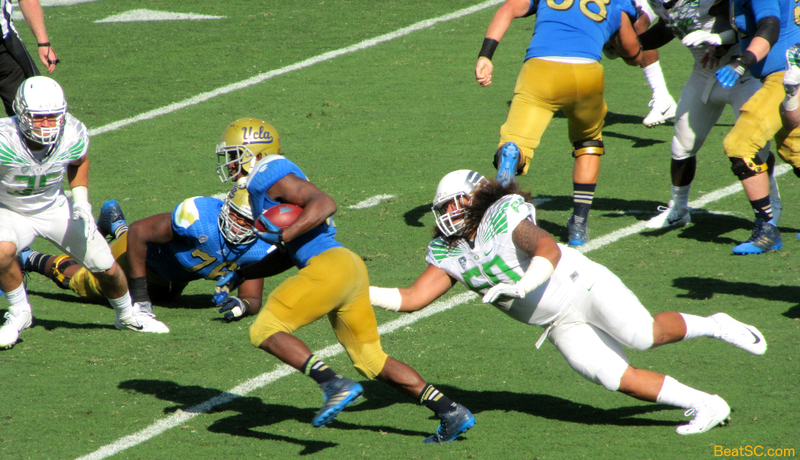 If you’re wondering how Arizona beat them, a lot of it had to do with Oregon missing one of their starting Offensive Tackles, who was back in the line-up against UCLA. I could perform some more analysis of this game, but I don’t think it’s necessary. The College Playoffs are now out of reach, and even winning the Conference or Division Title looks like a Pipe Dream. Beating u$c might be tough too. 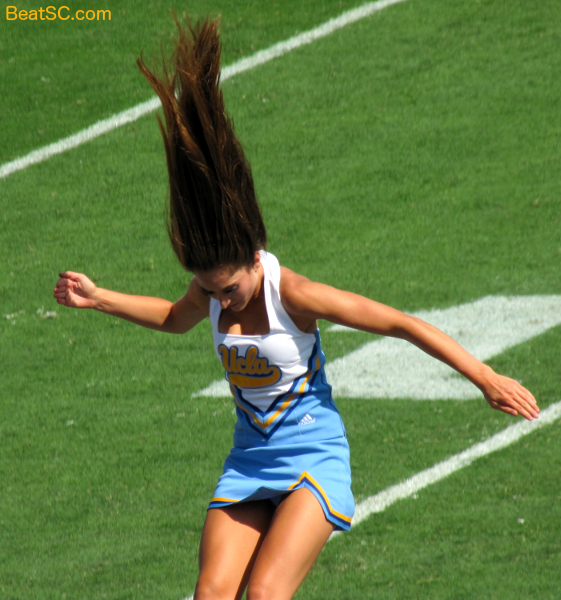 So instead of talking x’s and o’s any more today, I’ll just send some xoxoxo to the UCLA Spirit Squad. 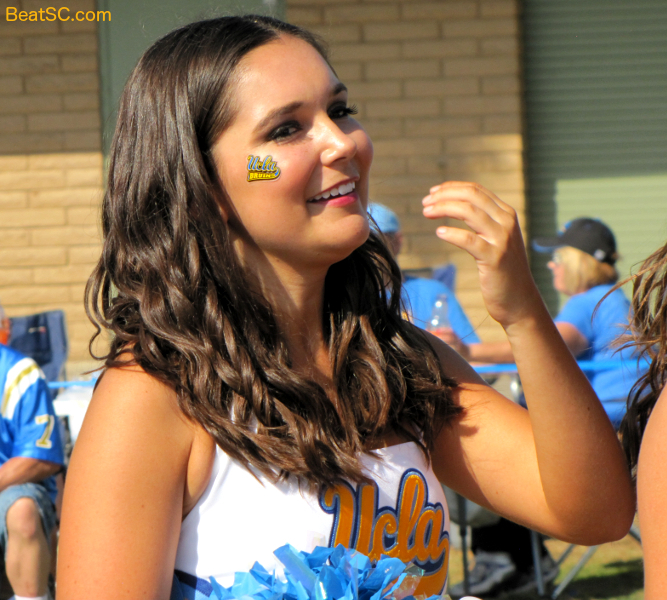 The Bruin Cheerleaders were awesome on Saturday, totally outshining the perennially-beautiful Oregon Cheerleaders, who actually have regressed since the last time they came to the Rose Bowl in 2009. 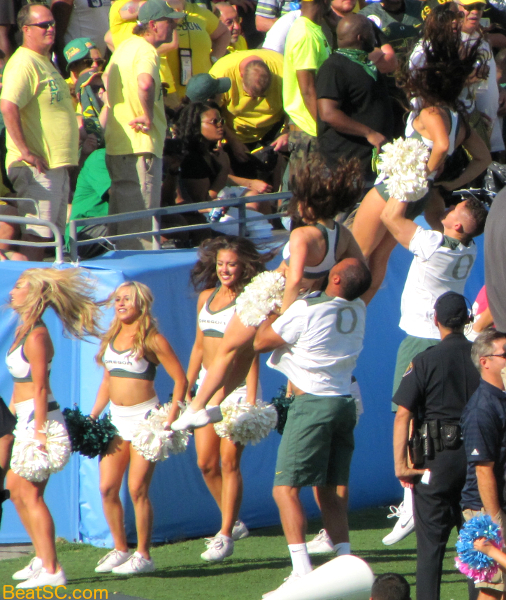 The photos below will show you that the Oregon girls are still better than most other squads, but that they are nowhere NEAR as attractive as the Bruin girls — and I’m sharing only the most flattering shots of the Duck Girls that I got. You don’t want to see the unflattering ones. Trust me. So… below are 33 Football photos from the game, 12 Oregon Cheerleader pics, and 33 UCLA Cheerleader pics, which include all 22 female members of the Cheer Squad and Dance Team. Click on them to zoom, and check back during the week for about 60-100 more. How to make a Heisman: Hold liberally on every play. Deon Hollins caused Mariota to throw it away here, but the Bruins didn’t get one single Sack all game long. 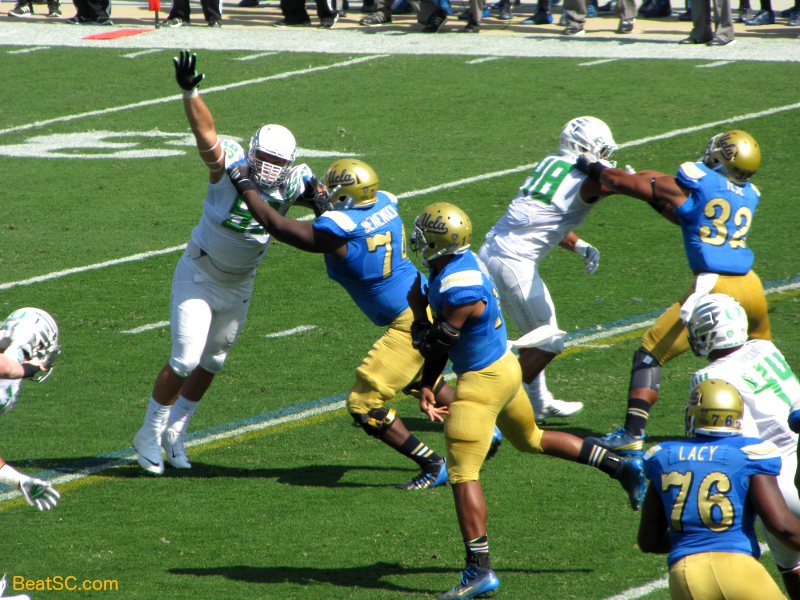 Eddie Vanderdoes almost got a Sack here. He almost got ejected too, for throwing a punch. Mariota could have run for 200 yards if he felt like it. The players weren’t the only ones to lose their heads. 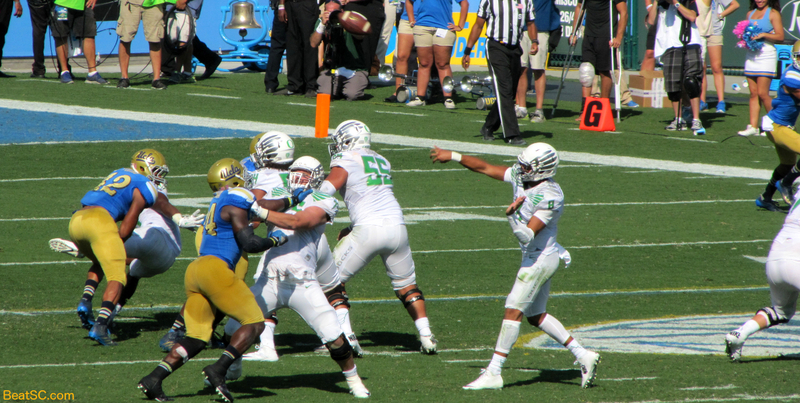 The Ducks found plenty of running room, thanks in part to well-executed misdirection, as well as unpredictable, varying play-selection. 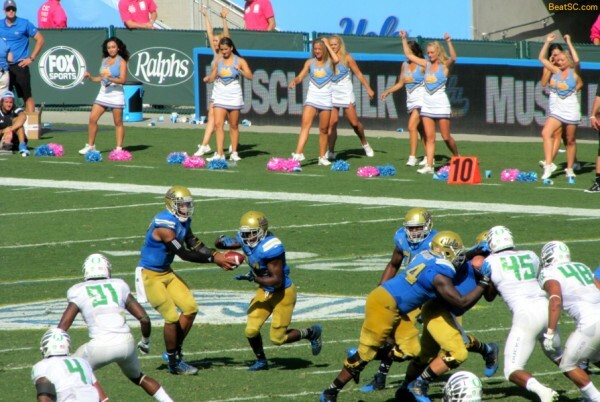 Here’s the TD pass where Myles Jack got burned. Look at the size of this hole. 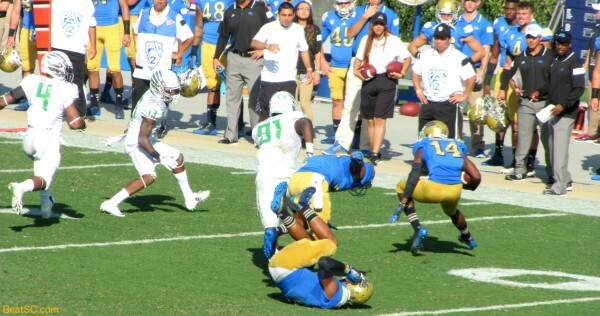 The Ducks spent lots of time in the end zone. 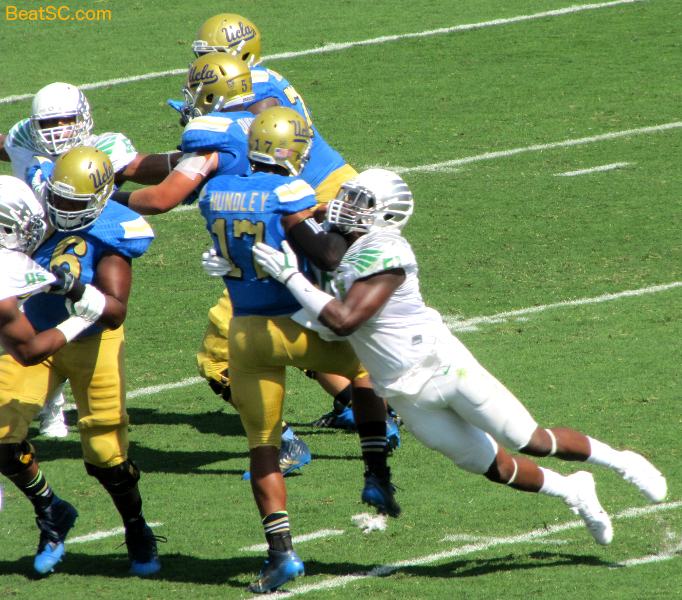 Kenny Young tries to stop another one. 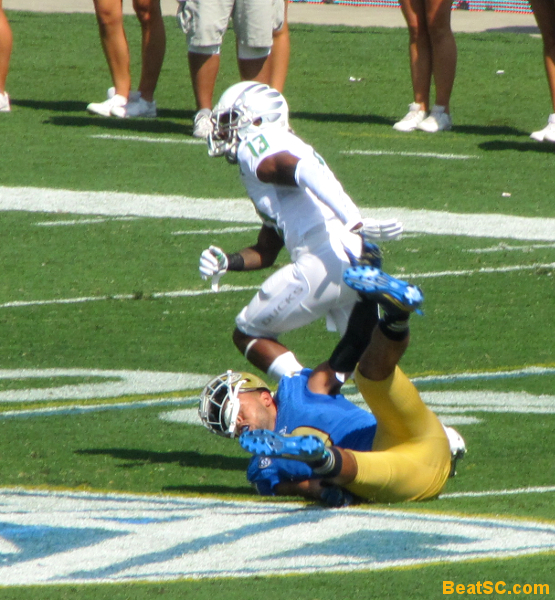 Best Defensive play of the day: Anthony Jefferson pops this Receiver so hard the ball went squirting out. Again Kenny Young gives it all he’s got. Kenny Clark and Isaako Savaiinaea try to obstruct a Mariota pass. Brett Hundley had his moments throwing the ball. 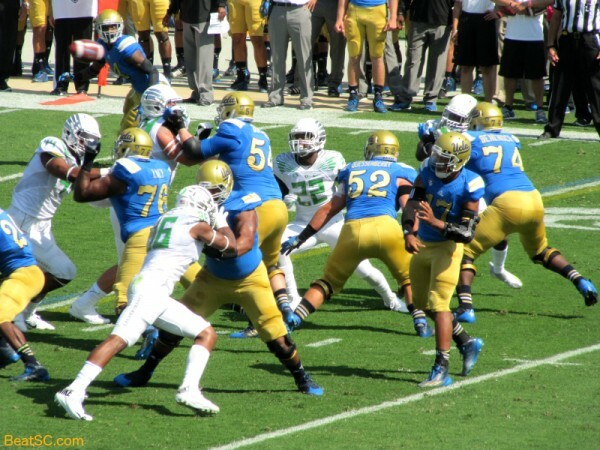 Hundley had more time this week, and was more alert except for one costly Sack/Fumble. He had a lot of catching up to do. 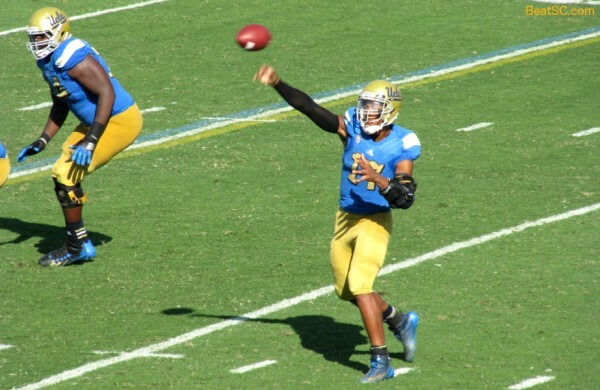 He’s pretty deadly when given time — One of the top accuracy Passers in the Country. 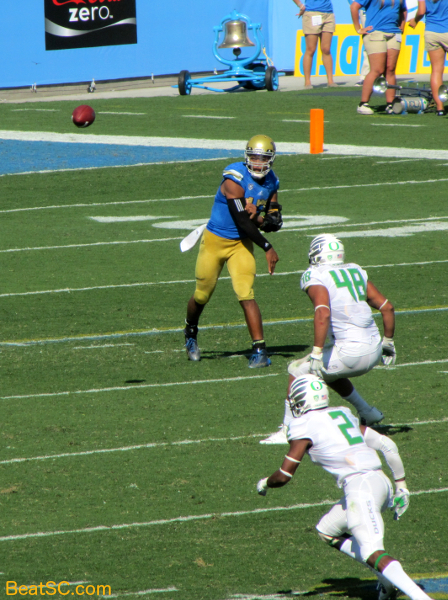 Down by 32, he hit Jordan Payton in the end zone with this pass. 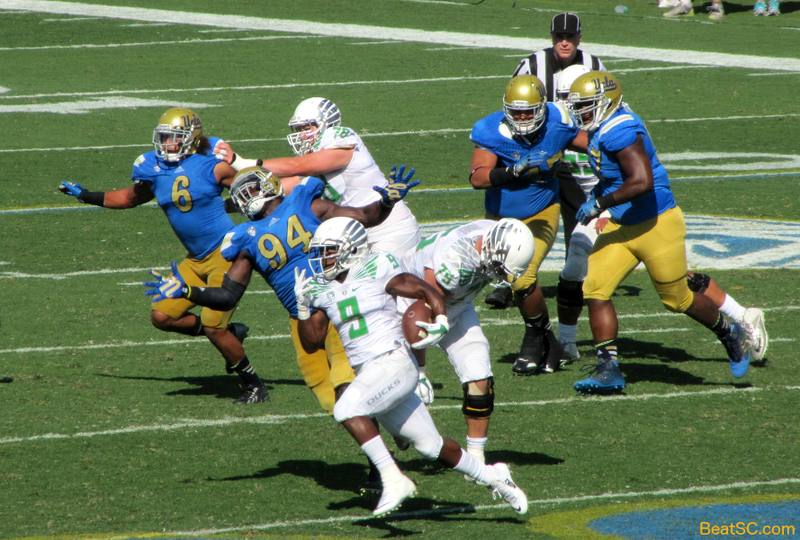 Then Nathan Starks cut it to 18 with this TD run. And finally Payton made this beautiful TD reception to cut it to 20. 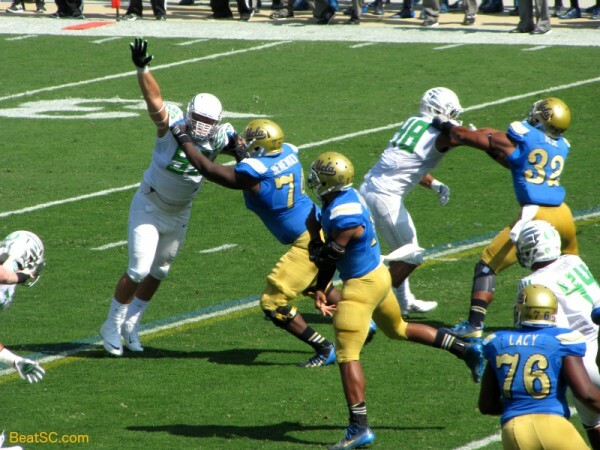 The Ducks pressured Hundley, but not like Utah did. And the Bruin backs had room to run as well. 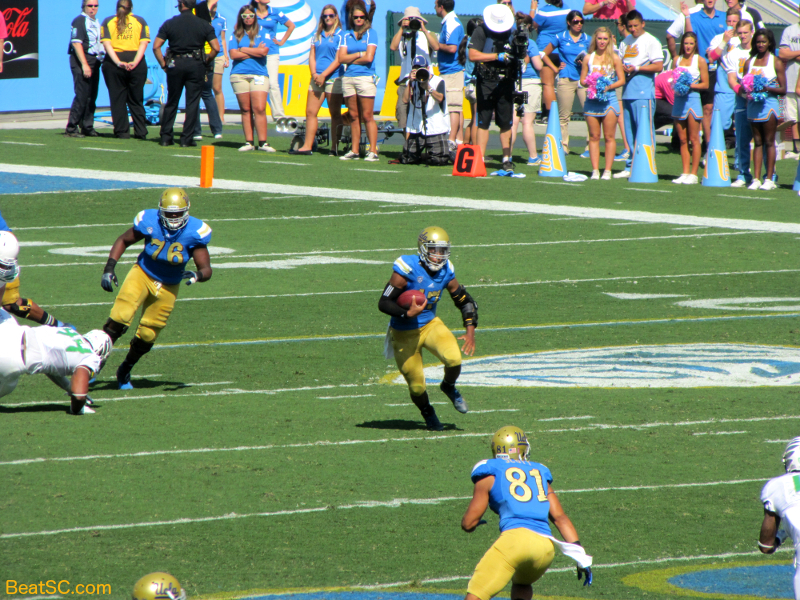 UCLA gained a total of 361 (gross) yards on the ground. Perkins usually found a crease, even in traffic. Oregon’s Defense is not as solid as their Offense. …even though not all the blocking schemes worked out. "THE UGLY DUCKING" was published on October 12th, 2014 and is listed in Blue & Gold News, Non-Rivalry Photos, UCLA/usc/Cheerleader Photos, UCLA/usc/Sports Photos. 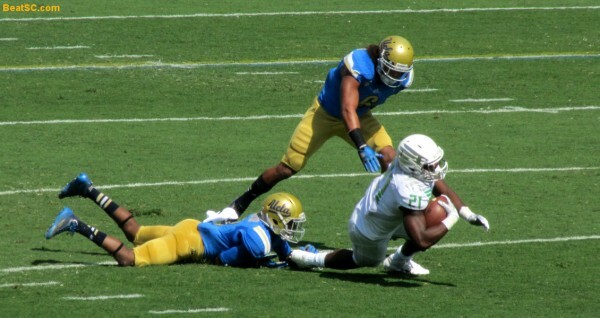 Thank you Bruin fans for your hospitality hosting us Duck fans and welcoming us to your party. It was a hard fought game. 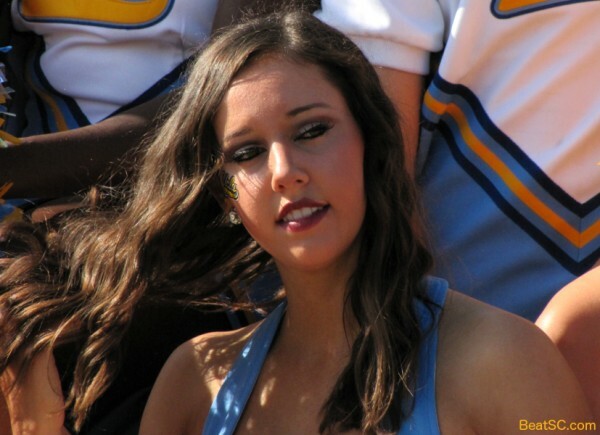 Will be cheering you on the rest of the way….especially when you play SuC! Go UCLA!! Stay healthy! Maybe we’ll meet up in December in Santa Clara but if we don’t, see ya in 2017!